If I had to select one book to be labelled the perfect supernatural fantasy (and fortunately, I don’t), I would choose Seanan McGuire’s Dusk or Dark or Dawn or Day. There is more story, more power, more poetry, and more creativity in this novella than just about anything I’ve ever read. Jenna blamed herself for her sister, Patty’s, death. Then Jenna blamed herself for her own death. But Jenna died too soon and so she spends her remaining time volunteering at a suicide prevention hotline in New York. One day Jenna realizes that the ghosts of New York are vanishing until she realizes that she is all there is holding the city in place. Jenna is unintentionally pitted against a corn witch that manages to trap Jenna in glass (a ghost prison of sorts). But Jenna isn’t one to sit by and instead takes matters into her own hands. The only drawback to this book is that it is too short. McGuire has created a world that feels so real and natural that I half expect to see a ghost as I head in to work. She has created some new ‘rules’ for the behavior of ghosts in literature (though I’m still personally fond of Jonathan Stroud’s Lockwood and Co series’ rules) and while establishing these rules McGuire has given us some interesting characters and a mystery that we get caught up in. And she gives us beautiful, lyrical language. Again…the book is too short to absorb everything that McGuire has put in here. A little more time with the mystery and a little more time to get to know Jenna and those around her wouldn’t hurt the book at all, and very likely would draw more people to the book. This book is number one on my recommendation list and it seals my appreciation for Seanan McGuire and her work. Looking for a good book? 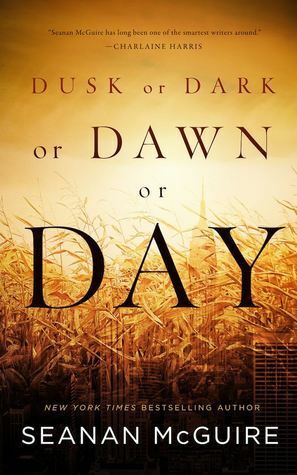 Dusk or Dark or Dawn or Day by Seanan McGuire may just be the perfect urban fantasy novella and its only shortcoming is that it is too short.